Each of Rutherford County’s 47 schools has protection from highly trained, armed and experienced school resource officers. Now, there’s a sign at the entrances to ensure everyone outside the school knows it. The SRO signs were recently provided through a generous donation from County Commissioner Pettus Read and his son, Shane. Commissioner Read first brought the idea to the School Board and other county leaders last spring during a safety meeting, and he later offered to cover the full cost — more than $3,000 — to produce them. His son designed the signs with input from Read, the school district and the sheriff’s office. Director of Schools Bill Spurlock thanked Commissioner Read and noted how simple solutions often times can have a lasting impact. “These signs will serve to reassure parents of our commitment to safety and to deter those who seek to harm our students and employees,” Director Spurlock said. Commissioner Read believes a community of schools, law enforcement and parents should unite to keep students safe. “We should help as parents, grandparents and families of our children,” Commissioner Read said. 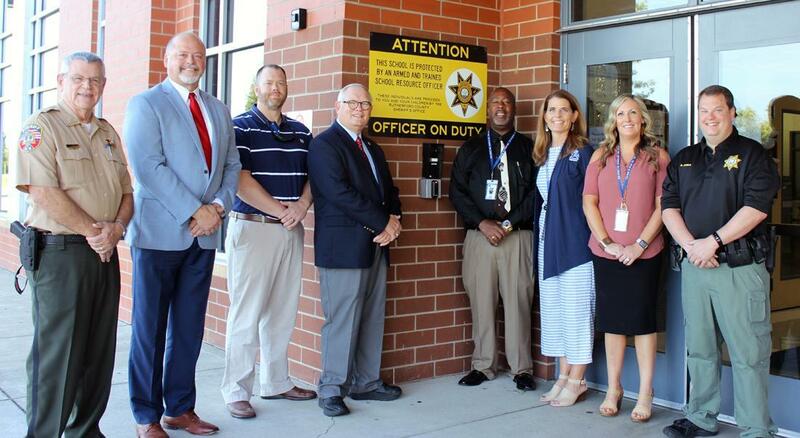 The signs are yet another element of the security plan for Rutherford County Schools, which includes a robust partnership with the sheriff’s office and its School Resource Officer program; controlled access to school buildings; and a comprehensive set of safety protocols that are practiced and refined throughout the school year. 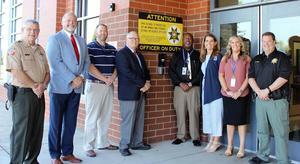 Bringing attention to the new “Officer on Duty” signs at each county school are, from left, Sheriff Mike Fitzhugh, Director of Schools Bill Spurlock, sign creator Shane Read, Commissioner Pettus Read, who bought the signs, Rockvale Middle School Principal Fred Barlow, Assistant Principals Kelly Newberry and April Sneed and School Resource Officer Barry Jones.